We show you how you can display a hashtag search or user timeline from Twitter in your layouts. You can display the latest tweets from a specific twitter account or a certain subject by adding the Twitter widget into a zone. Select your designated zone and enter the zones playlist by double clicking on the zone, or click 'Edit Zone Playlist'. 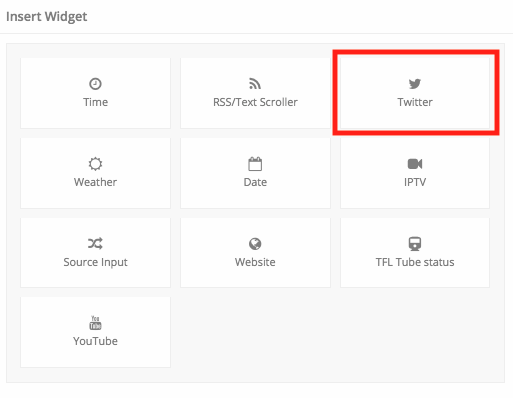 Click 'Widget' and select 'Twitter' to insert the twitter widget. Type - Select 'Users timeline' to show tweets from an account or 'Search' to show tweets from a subject. 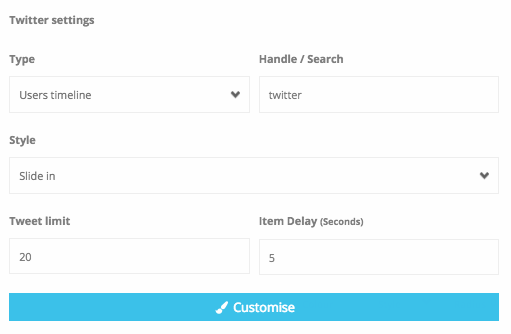 Once the widget has been set up, click 'Customise' to edit the style of the tweets. Simply highlight the text and use the options to customise the formatting styles. When you are happy with the formatting style, click 'Save Changes' to go back to the zones playlist. If you have finished editing the playlist, click 'Finish Editing Playlist' or the 'X' in the top right corner to go back to the layout builder overview.